Well, I’ve started to mess around with Cloudkit. An d, before I could get out of the gate, before I could write a line of useful code, I ran into some troubles. These are probably due to my unique quirky circumstances. But then again, there are probably a small handful of developers who may have run into some of these problems and perhaps my blunders and lessons learned may be of help to you. 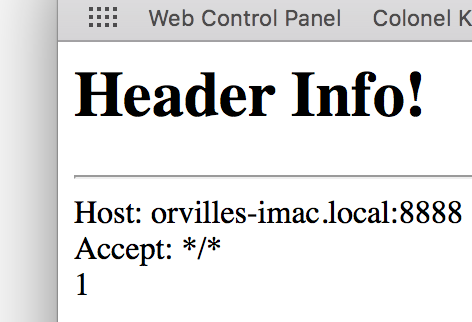 First of all, the Cloudkit Dashboard only “kind of” worked. First problem here: I created my developer Apple Id a long long time ago when it could be anything (as long as someone else didn’t have it already). Now, various Apple tools want your Apple Id to be a valid email address. Mine was not an email address! Never had been! First of all, I created a new Gmail account just for my Apple Development work. Then I had to figure out the process for changing my Apple Id. I dreaded that I would have to re-log into everything, and have things blowing up left and right. It turns out the process was not that scary and I did not have to re-log into everything! Phew! The nasty messages about needing to have my Apple Id be an email address went away. Second Problem: my iCloud log on. When trying to access the private database in my project’s container, it said that I wasn’t logged into iCloud. But I was logged in! I checked! On the Cloudkit Dashboard, I created a new record type in my private db, added a couple fields to it, and added a couple indexes to it to boot! For now, on my Mac, I’ve set up a separate developer log on. If that’s what I need to do to get things to work that is what I will do. There is still a bunch of other things I need to set up on this new user account to make it usable for more than opening Xcode and building apps. I’d rather have a spot in Xcode where I could log into iCloud just for the apps I’m building. Perhaps it’s there? Am I missing something? If you know something that I don’t leave a comment below. So you want to get content from another web site out there to use on your site. You may be doing screen scraping of a page out there… But a better use is to get info from some sort of a web API. Case in point: Calling a URI from the U.S. Weather Service to get current weather information. It works fine. I do any Ajax call to “weather.cfm” from my home page, parse of the current temperature, and weather description and display it on my home page. Nice! 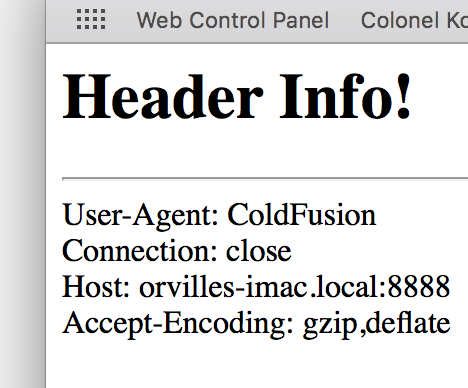 This was running in ColdFusion Developer on my iMac and I can access on my personal wifi network. Notice that the URL is the same one as I’m using in the ColdFusion example. So what happens if I directly call this “weather.php” page I created in my Safari web browser? Well, we get a page like the one displayed above. Bummer! 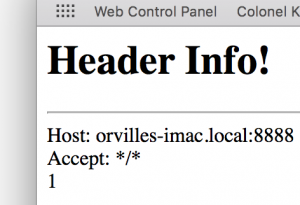 This is running on a PHP MAMP server on the same iMac as the ColdFusion server is. And trust me, the ColdFusion server is not calling this URL with any special permissions! This led me to suspect that there was something different about the HTTP Header being sent by the ColdFusion server than was being sent by the PHP server using cURL. I was going to create a PHP page that would look at it’s HTTP Header values and output them to the page for me to be able to see! 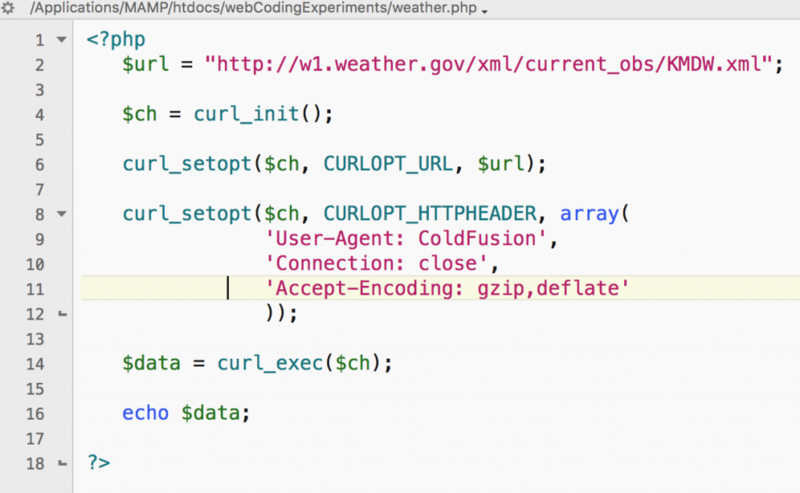 Now, if we changed weather.php to point to this URL, what do we get? Note that the ‘1’ at the bottom is an artifact of cUrl (unless you set the CURLOPT_RETURNTRANSFER option to true. What about doing the same thing with weather.cfm ? Notice above how I added a new block of code (lines 8 through 12). 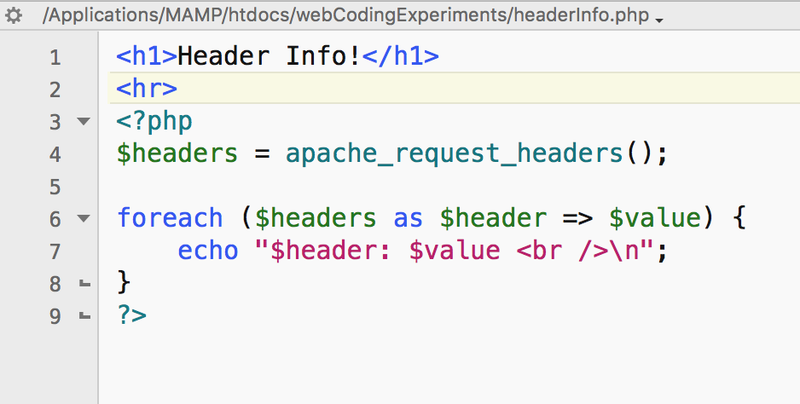 This is adding three headers to our HTTP Header: ‘User-Agent’, ‘Connection’, and ‘Accept-Encoding’. I saved my changes and refreshed this page. But is the server looking for all three of these headers? I remove ‘Accept-Encoding’. I refresh the browser. It still works. I remove ‘Connection’. I refresh the browser. It still works. And (of course) I remove ‘User-Agent’. I refresh the browser. And of course it fails. So, ‘User-Agent’ is the key. Currently, in our example, it is set to the value of ‘ColdFusion’. Because that is the value I got when running the ColdFusion page. But actually (of course) our page is a PHP page when is requesting the info. 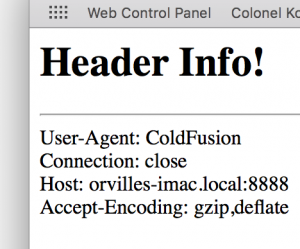 I change the value of ‘User-Agent’ from ‘ColdFusion’ to ‘PHP’. I refresh the browser and it works. 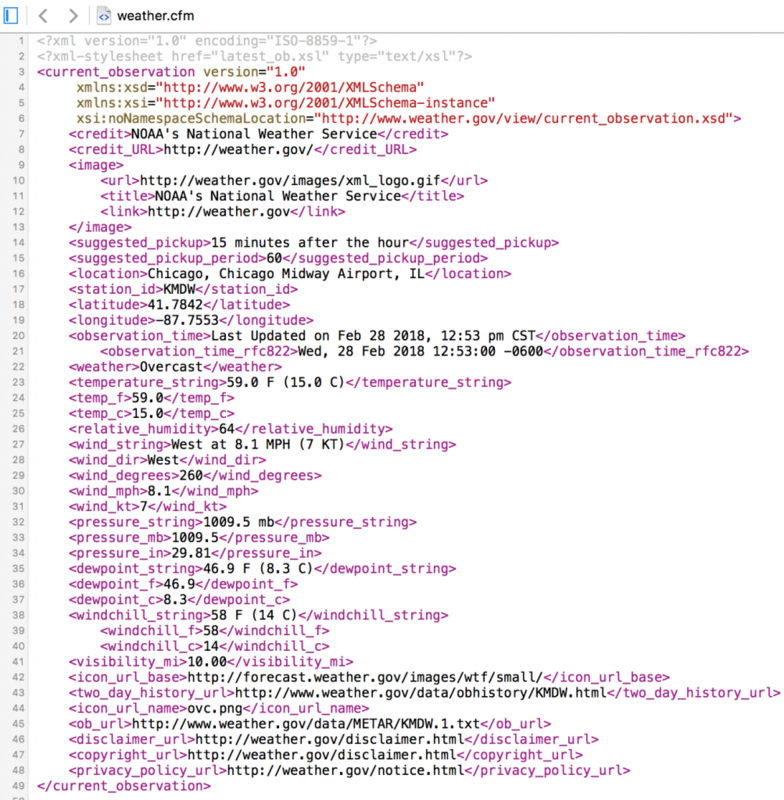 I wonder, is: w1.weather.gov looking for specific values for this header, or just that the ‘User-Agent’ header is present in the HTTP header? So, I change the value of ‘User-Agent’ to: ‘SugarBoogers’. I refresh the page and it works! This means that the server (at least in this case) is just checking to make sure that the ‘User-Agent’ HTTP Header is present and has a value… but doesn’t care WHAT the value is (I’m sure that ‘SugarBoogers’ is not a common user agent to check for! You might be able to “screen scrape” a web page without custom setting any HTTP headers. But I suspect that if your calling some sort of XML feed, JSON resource, or web service URI, there’s a good chance that you will need to set the ‘User-Agent’ HTTP header in order to get it to work. Any comments? Thoughts? Let me know. This is an experiment in rendering a lot of UI elements (entities) without having poor performance. In that, it will only render to the DOM entities that can currently be seen in the view port. Right now, by default, it generates 200 entities. Try 2000 or 20000, or any other positive integer value, and see how it performs! There are still a few bugs in it (its rendering too many entities at a time for example), but I think it proves its certainly possible. For some strange reason on my work computer the F12 Developer Tools option was disabled on my Tools menu in Internet Explorer (IE 11). Other devs on my team had access to it, but I did not. Click the “Start” button in the lower left-hand side of your screen. You may be prompted to enter your Window user name and password, if so, enter it in. The Local Group Policy Editor will come up. On the left hand side of this window is a tree navigation control. Make sure that the Computer Configuration node is expanded. Under that, expand the Administrative Templates node. Under that, expand the Windows Components node. Under that, expand the Internet Explorer node. 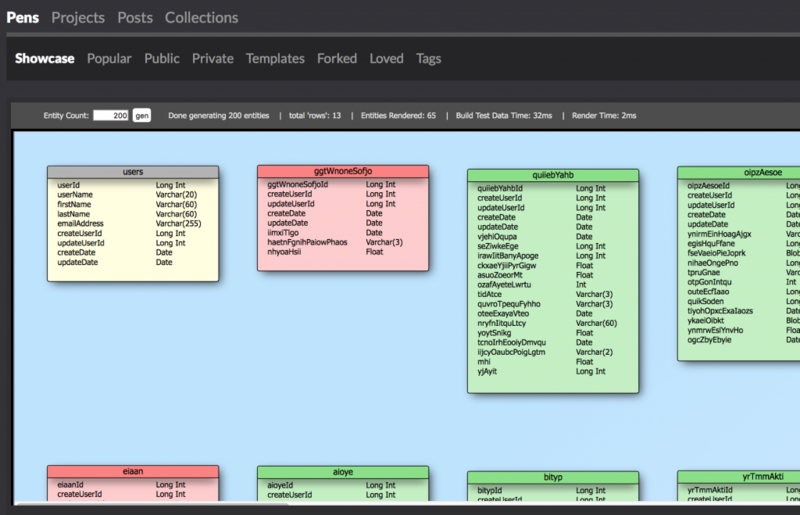 Under that, select the Toolbars node. Click the edit policy setting link to the left. Pick the Disabled option and Apply the changes. That is it! After I did this the F12 Developer Tools option in IE was accessible to me! I began working on a web site written in Java using Struts2. I wrote a general purpose class to be used by the application. One method in the class was supposed to check if the user was logged in. If not, redirect to the logon page (I did NOT want to add a tag entry to every <action> block in the struts.xml file)! Note the try/catch block must be in place in order for this to compile and work. In the above example I made up some arbitrary packages names. You will have your own structure in place. If this works you should never see the success or failure page. In a real world scenario, the redirect would having only if a certain condition was being met (such as the user is not logged in). If the user were logged in, demoPage.jsp’s contents would appear. Its on Apache, using PHP, mySQL, and a .htaccess file. After futsing about I got the .htaccess file doing what I want for my new blog software (I am no expert on this file by any means though). The development environment is my iMac using MAMP. I’ve got it reading a site table in my mySQL database. This software will support multiple sites on one server! Next I’ve got to look up how to use sub-string functions in PHP. I need to take the rootPath field value from my sites table and compare it with the beginning of the URI that the user typed in in their browser. If it matches, I will set the site id, if not, I want to have some sort of fall-out page. What if a user’s PC has less memory than me, are they going to get out of memory errors? What if a user’s PC has a lot more memory than I do… then they really will not be able to leverage that extra memory to their advantage. Am I missing something? Are there functions or object properties that I’ve missed? If you are a web developer working on some data intensive stuff on the client side don’t you wish you had these functions available? I assume strings may use 1 byte per character (or do they use 2 bytes to support unicode). I assume booleans take the least amount of memory (possibly 1 bit)? There are integers and floating point values… how many bytes do they use each? What is the overhead number of bytes for each variable and for each element in an array? Knowing this information could be helpful in deciding how to store information in memory the most efficient way. This looks like an interesting JS library: something where you pass in a variable or JSON string and it returns how many bytes it takes up. I have to investigate this further when I have some time! For all the benefits of using WordPress for my blog, there are many more draw-backs. Sometimes I wonder if I would have been better hand-coding my blog! Writing a post like this that only contains your basic text, its fine. You start wanting to embed pictures or perhaps videos and it behaves very badly. I lost a whole long post recently 🙁 . So, over vacation I started filling out a notebook with designs for my own blogging software. I’ve been doing a lot of content management software at work so doing content management type stuff is fresh in my mind. My goal is to get off of WordPress and get off soon. I want to be able to put together posts efficiently. I want to spend my time writing and refining my posts, not struggling with the technical problems of the platform I am using. The database I am using is mySQL. I was going to write the blog software in Coldfusion (since that is what I am most comfortable with). But I have decided to use PHP. All nice and open source! 🙂 I’m developing it in a web instance running on my iMac using MAMP. Goal: That I have a local instance working with basic functionality by this Saturday. fabs() – Gets the absolute value of the value in parentheses. Works like ABS() function in Visual Basic. fabs(-123) = 123, fabs(34) = 34.
ceil() – Find the ceiling integer. Kind of like rounding up. Same as INT(x+1) in Visual Basic. ceil(3.1) = 4.
floor() – Find the floor integer. Kind of like rounding down. Same as INT(x) in Visual Basic. floor(3.6) = 3.
exp() – Find the exponential value. pow() – Raise a number to the power. pow(3,6) = 3^6 in Visual Basic. rand() – Generate a pseudo random number. Function is RND(x) in Visual Basic. A good discussion on random numbers in Objective C can be found here. srandom() – Generate a seed for the random number generator. This is done with the Randomize statement in Visual Basic. sqrt() – Find out the square root of a number. sqrt(x) = x^(1/2) in Visual Basic. Those of us who have the responsibility of producing customized Excel workbooks, and Word documents that essentially have become small powerful applications in their own right are always looking for ways to make the tools we build in these Microsoft Office products more powerful, easy to use, and more like actual stand-alone apps. One of the ways I looked at enhancing the “tools” I created was by adding a tool bar to an Excel workbook for example. I first did this myself in Excel 2003. It was tedious but doable. One draw-back in the way tool bars were done back then is that the changes applied to the whole app (Excel or Word), and one screw-up on your part could truly clobber Excel or Word’s tool bars and menus system wide.